Casting Crowns have been making inspirational music for over 10 years, and have consistently topped the charts with their rock balled sound soaked in lyrical theology. ‘The Acoustic Sessions: Volume One’ boasts some of the mega-bands most popular tracks re-recorded with an acoustic set-up, including two brand-new tunes! This album is so much more than an acoustic album – it’s a gorgeous listening experience. Each of the 10 songs has been lovingly arranged with creativity and a prayerful attitude. Soft, smooth and harmonious tones flow through the entire album. Some tracks are piano ballads laced with a violin, while others are transformed into stripped down versions with a satisfying musical texture (including a hammer organ, mandolin, soft drums, Irish whistle, fresh vocal harmonies and several acoustic guitars). The whole album is an intimate experience, with passionate vocals from Mark Hall and beautiful arrangements of forgotten classics, such as ‘Who Am I’, ‘If We Are the Body’ and ‘Praise You in This Storm’. Simply unmissable – these elegant anthems will sooth your hectic mind, calm your troubled heart, refill an empty spirit and revive a worn-out faith. The Acoustic Sessions: Volume One by Casting Crowns was published by Provident Integrity Europe in January 2013 and is our 13725th best seller. The ISBN for The Acoustic Sessions: Volume One is 602341017824. Be the first to review The Acoustic Sessions: Volume One ! Got a question? No problem! Just click here to ask us about The Acoustic Sessions: Volume One . Ever committed to the simple but profound story of truth, Casting Crowns has impacted millions with powerful songs like "East To West", "Who Am I", and "If We Are The Body". Now fans can experience these favorites and more on the new acoustic project The Acoustic Sessions: Volume 1. In times of difficulty and in moments of praise, these songs have provided the words so many hearts long to communicate. 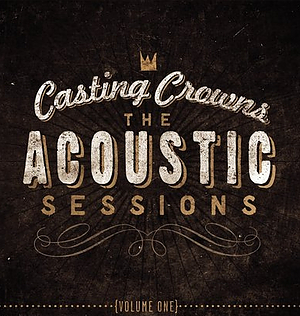 Including two BRAND NEW songs, Acoustic Sessions: Volume 1, is a must have for any Casting Crowns fan. Megan Garrett has lovingly re-imagined the song on her piano, originally driven by guitar and drums. Her delicate new arrangement is gorgeous, washing over the powerful lyrics bringing fresh emphasis and striking beauty. A simple harmony on the violin has been weaved into the background, adding soothing undertones. The result is stunning – it makes me wonder why they didn’t do this the first time round! The song begins with soft piano chords, drops into an empty yet majestic chorus, and then builds into a fuller sound. With more surprises then a game of pass the parcel, this song keeps on twisting and turning echoing God’s astonishing sacrifice. I had forgotten this song, but as soon as I heard the first line it came flooding back. With several layered acoustic guitars, picking and strumming and playfully intertwining, a warm sound radiated through the speakers that brought a smile to my face. With a hammer organ, perfect harmonies and rhythmic drums, this forgotten track that’s been hiding away for years has been given new, mischievous life. I love it. Perhaps the most beloved Casting Crown’s song, ‘Who Am I’ was given Gold Certification in 2011 (having sold over 1 million copies). This rendition is just as powerful as the original, and twice as soothing. Mark Hall takes a breather and hands the microphone to Melodee DeVevo, backing vocalist and violinist. A refreshing change on the ears, she sings with creativity and passion. Originally an epic power ballad with heavy guitars and strong finish, this acoustic song couldn’t be a bigger contrast. With a laid back drum beat, the music floats with little effort allowing the story of a praying Christian asking for courage to drift to the surface. Those who have loved Casting Crowns from the very beginning (including myself) will be satisfied with a respectful and artistic treatment of this incredibly passionate song. This brand new tune is a cheerful addition to the album. The drums shuffle and drive the chirpy melody, whilst a rhythmic mandolin playfully strums over the top. It’s obvious that Mark Hall was away when writing and recording ‘Delivered’, with a noticeable lack of faith-enriched lyrics. But that aside, this song lifts the mood of the album (plus the last minute finishes the song with a flourish as an Irish whistle and violin take turns to musically dance an energetic solo). The world-wide hit, ‘Somewhere in the Middle’, has a poetic quality that transfers into a piano ballad perfectly. Stripped back to nothing but Mark Hall’s passionate delivery and beautifully arranged piano accompaniment, the song holds simplistic in both hands. Each time I listen to this song I learn something new; it’s like an insightful Bible study captured in song. An inventive and well-produced beginning, you can barely recognise the opening. But once the song builds to the chorus the song reveals itself as the powerful freedom song – ‘Set Me Free’. This acoustic version keeps the dramatic and moody feel which gives this much-loved song its power, with added harmonies from voices, guitars, electronic effects and violins. The second original song on the album, ‘Only You’ has a driving and energetic rhythm running through and pushing the song forwards. A minor verse and major chorus creatively intertwines, creating a clever musical tension. A song that has impacted millions, ‘Praise You in This Storm’ shines as the stand-out track on the entire album. I might be slightly biased (as this is one of my favourite songs), but this song is genuinely better than the original! At Gale-Force 10, the original recording held nothing back powering through the stunning lyrics and pounding out the chorus. Surprisingly the acoustic version doesn’t entirely loose the ferocity of the song, beginning with thumping, deep piano chords. Then the song slowly builds with each second until an intricate string arrangement empowers Mark as he sings out Psalm 121:1-2 with fiery passion. Stunning! – every Casting Crowns fan must listen to this inspiring arrangement. Scroll up to the top of this page to watch the video and listen to rest of the album in 30 second samples. I hope you enjoy listening as much as I have. Now Playing: If We Are the Body [Acoustic] Your browser does not support the audio element.